A template system with template keys. Help you locate where to change your text and images. Webkeytemplate is a database driven CMS application for windows. It will help you to keep track of your content in your homepage. It will help you to create new web/HTML pages. A web page consists of HTML code and CSS rules. With Webkeytemplate, you do not need to bother about it - but if you want, you can! You can use templates which are included in the program or you can import templates to Webkeytemplate from any third part provider. If you are a developer you can create templates, export them and let your customer or friend import them to Webkeytemplate. A webpage can be designed in endless ways, but the thing in common is that webpages are usinge a gridsystem to display the information. For example, the first row contains one column, the next row contains three columns. Finally, the last row contains one column. In webkeytemplate the whole page is considered a template. It is up to the person creating the template to divide the page into separate layouts. In this case you could create 4 layouts. The root layout consists of HTML code, but somewhere in the code there are < < keys > > . Those keys are like folders in windows explorer. They contain sub layouts and text, images or files. � The text is edited with a memofield editor, This editor handles some basic inline HTML functions. � The images are stored as binary files in a database table. Webkeytemplate manages the location and presentation. � The files are referenced and managed considering location. Where to find. � The layouts are edited with notepad. Thats because the basic HTML tags are sometimes in conflict with the text memo editor. If you are not a developer and you do not know anything about HTML, your might not be interested in how to structure the different parts / layouts of a webpage / template. Let's say you just want to change the text and images that an existing template consists of. One way would be to open the file containing the HTML code for editing, but you probably find that to confusing. Webkeytemplate program has a treeview functionality (almost like windows explorer) that will show you the structure of the webpage. Windows Explorer is the operating system's file and folder manager. 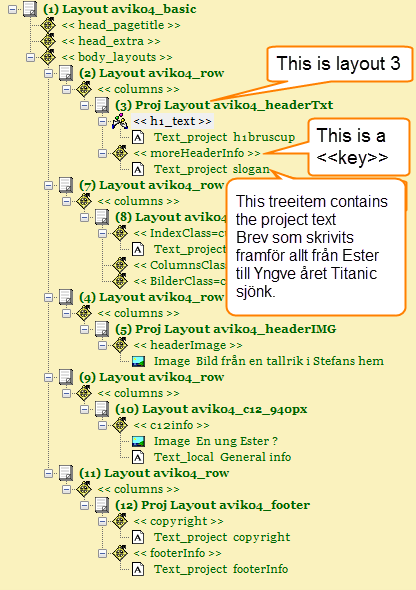 And the treeview in webkeytemplate is the (text, images,and files) and layout manager. 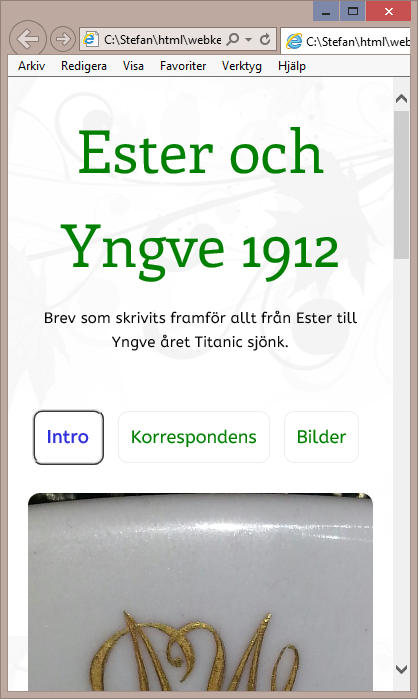 A webpage explorer. This is the first window you will see when starting Webkeytemplate. This is where you create new projects, add new pages to the project. Open up the window for creating / changing layouts and CSS rules. Creates new pages. Renders the page in Windows internet explorer. That's the same as starting your internet explorer browser with the generated template. This is a page generated without and with layout id's and keys. The page is created from a template called "in response" The HTML code is generated by webkeytemplate without layout id's and keys. And this page is generated by webkeytemplate program with layout id's and keys. It doesn't makes the page look better !! So whats the point ? It helps you locate layouts, text, images and change your web page without editing any HTML code. 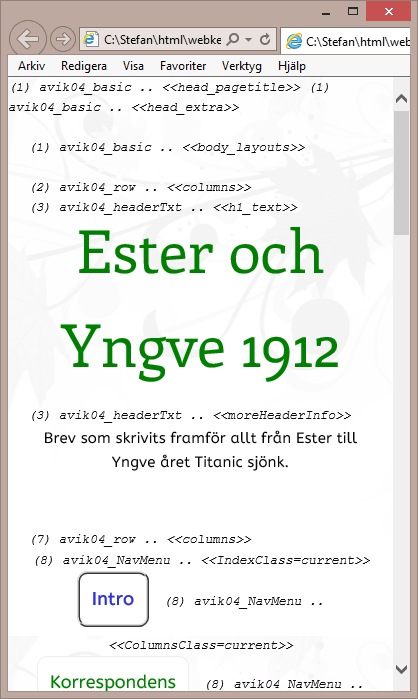 If you are comfortable with editing HTML, then you can edit the layouts to of course. But you can do more than just editing text and changing images. You can copy treeitems from one treeview to another, or within the same treeview. 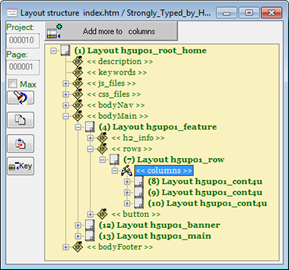 When creating a new page you can choose root layout from any existing project and page. Or you can choose from the CSS and layout database. Complicated ? No we will explain more.... keep on reading !